The Haddonfield High school boys lacrosse team. When a Haddonfield boys' lacrosse player used a racial slur against a black female athlete from another school earlier this month, it was the latest in a disturbing pattern of behavior at the elite South Jersey school, parents, coaches, and former students say. For years, athletes from opposing teams say, they often heard the N-word and other offensive remarks during competitions against Haddonfield, a powerhouse in local sports. Renee Williams Bey, the mother of two former Sterling football players and wrestlers, said it was not uncommon for her sons to hear racial slurs during games with Haddonfield. "It just happened all the time," said Bey, of Somerdale. "They did it to everybody." Former Haddon Heights assistant football coach Paul W. Palmer said he would carefully prepare his players for the annual Thanksgiving game against Haddonfield and warn them how to handle a potentially volatile encounter with their archrival. “Every year before that game, we have to warn our kids that they may be called the N-word! If you are, you cannot retaliate, because you [will] be thrown out of the game!” Palmer, a former Temple football standout and recent College Football Hall of Fame inducteelacross , wrote in a Facebook message. The incidents suggest a culture in which racial problems have festered, said Lloyd D. Henderson, president of the Camden County East branch of the NAACP. "It's a culture that has now been exposed," he said. The most recent incident, which occurred during a girls' track meet with teams from Haddonfield, Haddon Heights, and Sterling, has sparked an investigation by the civil rights division of the state Attorney General's Office as well as a complaint with the New Jersey Interscholastic Athletic Association. An internal school investigation concluded that one of Haddonfield's lacrosse players had made the offensive remark, but failed to identify which one. That led interim School Superintendent David T. Lindenmuth to cancel the lacrosse season, ending the team's bid for a state championship. Ever since, the growing controversy has divided the school and pricked nerves in the predominantly white borough of nearly 12,000 residents founded by Quakers in the late 1600s. "This was an aberration. It was wrong," Mayor Neal Rochford said in an interview Friday. "We need to step up and take ownership of it. Let's see if we can make sure it doesn't happen again." In canceling the season, Lindenmuth said: "During the course of this investigation, some issues were discovered that are completely unacceptable for this community." He announced a series of immediate actions, including outreach to the NAACP and diversity and sensitivity training for students, staff, and coaches. "There is no room for hate of any kind at Haddonfield schools and it will not be tolerated," the superintendent said in a statement. "It is not who we are and it does not represent our student body." Lindenmuth did not respond to repeated requests seeking comment for this article, nor did School Board President Adam Sangillo. In interviews with students, parents, and school officials and a review of documents obtained under the state's Open Public Records Act, the Inquirer and Daily News pieced together details of how events unfolded, how the school investigation was conducted, and how the district has responded to better promote sensitivity and inclusiveness at a time when the country remains starkly divided by race. On May 1, a black female athlete from Sterling said she was stretching on the Haddonfield track when several players on the lacrosse team walked by and one of them said: "Move 'N-word,' " according to a police report filed later that day. Haddonfield police said the incident was reported as a possible bias incident. The complaint was referred by police in Somerdale, where Sterling is located, according to the investigation report. The major crime unit of the Camden County Prosecutor's Office was also notified, officials say. The girl and her parents said they did not want to press criminal charges, so police closed the case and agreed to allow the school to investigate. School officials gave the team an ultimatum: Confess or else. They canceled team practice for two days and held team meetings and called players in one-by-one in an effort to identify the player who made the offensive remark. They gave a deadline for someone to come forward. No one did. So Lindenmuth canceled the remainder of the season. The team was 8-0 in its division and 9-5 overall. There were accusations on social media that the school rushed to judgment and that the lacrosse players were denied due process. Others lauded the decision to punish the whole team because no one would speak up. On the track on the day of the incident, Haddon Heights athletes Cydney Thomas, 16, a sophomore, and Lani Newbold, 15, a freshman, both black, said they were standing nearby and heard the racial slur. The Sterling athlete and her teammate who also heard the comment were left in tears by the encounter, they said. Both teams immediately notified their coaches, they said. "Everybody should speak up for people that they feel are scared to speak up," said Thomas. Newbold said a group of athletes also approached Haddonfield coach Damon Legato and told him what had happened. The coach repeatedly asked if anyone could identify the lacrosse player, she said. "He kept saying, 'Who was it? Was he short? Was he tall?' " she recalled. The girls could not identify the person who made the remark because the lacrosse players were wearing helmets, she said. Legato and athletic director Lefty Banos did not respond to messages seeking comment. Lacrosse team members and their parents also declined repeated interview requests. Haddonfield has not yet filed a report with the sports association to provide its account of what happened, said Larry White, the group's executive director. In the days after the incident, during homeroom, every high school student was asked to complete a survey that included questions about race relations. Black students were summoned to meet individually with principal Charles Klaus and dean of students Tammy McHale to share any concerns. They were also asked if they believed the lacrosse encounter was an isolated problem or a part of a bigger issue. Students at Haddonfield High were asked to complete a survey on the racial climate at school after a lacrosse player was accused of using a racial slur. "People are just ignorant. The majority are not racist," said Adianna Alston, 18, a senior and aspiring lawyer. A tuition student, Alston, of Williamstown, said she agreed to help set up a student-run group to tackle diversity issues. The high school's population is 90 percent white, 4.2 percent Asian, 2.2 percent Hispanic, 1.5 percent black, and 1.9 percent multiracial. The school enrolls about 850 students in grades nine through 12. 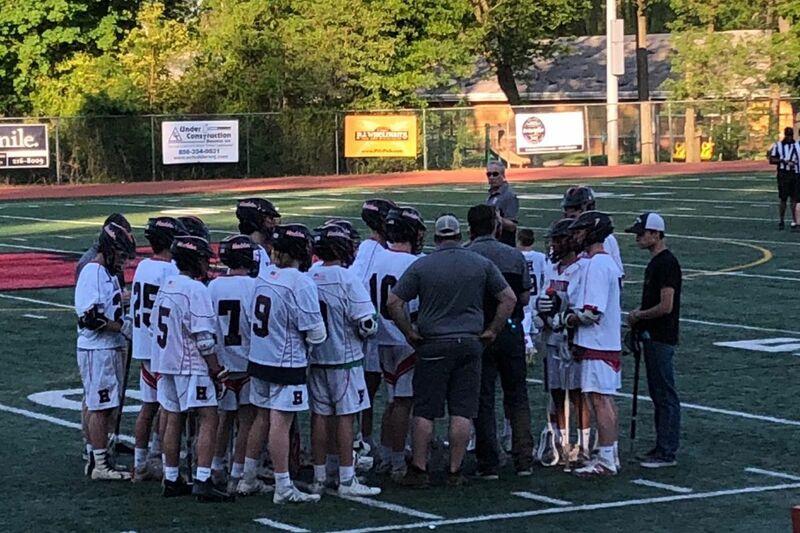 At one point, in a gesture to try to resolve the matter, Banos, Haddonfield's athletic director, offered to have the lacrosse team apologize to the Sterling student who was called the racial slur. The girl's father, James Dizzley, confirmed that there were plans for the team captains to meet with him and his daughter, but said the meeting was canceled. Banos took similar action recently when freshman football players riding on a school bus yelled a derogatory term for gays out the window at Haddonfield's color guard squad during a practice, said a parent who asked not to be identified for fear of reprisal. The team captains were taken to the color guard and apologized, the parent said. Lindenmuth, the first black schools chief in Haddonfield, said the district would conduct diversity training for students and staff. Additional procedures and requirements are planned for all sports teams, he said. A meeting to discuss diversity was planned for Saturday in town by a group of concerned parents and residents. Longtime resident Susan Hoch calls the incident Haddonfield's "me too moment" in a town with a past marred by racial intolerance. In the 1920s, the Ku Klux Klan marched down Kings Highway and Jewish families were subjected to anti-Semitism. "This is not an isolated incident in the schools," Hoch wrote in an email. Sterling, in its complaint about the racial slur at the track, cited another incident this school year that it said happened after a girls' basketball game with Haddonfield in December. A white assistant coach from Haddonfield gave high-fives to the opposing team's white players, who were lined up to congratulate the other team, but skipped two black players, Sterling said in the complaint. A school ranked academically among the best in the country, Haddonfield has earned a reputation as a fierce competitor in sports. The season's cancellation is believed to be the first time a New Jersey school has ended a sports season in progress since 2014, when the Sayreville football program was shut down by incidents of bullying, harassment, and intimidation, according to the New Jersey State Interscholastic Athletic Association. For the 2017-18 school year, the association has referred six cases, including the Haddonfield incident, to the Division on Civil Rights, said spokesman Michael Cherenson. All involved racial slurs during competitions, he said.